Can we vent for a second? Great, we knew you’d understand. We love poker, and we love the idea of attracting more people to come out and play poker with us. However, the truth is that people are losing money and getting angry. They come to us and say that they just don’t understand why they’re not doing as well in poker as they would like. They’re obsessed with watching it, and they’ve read all of the theory guides. So what guides, really? The truth? You might be ignoring the flop. 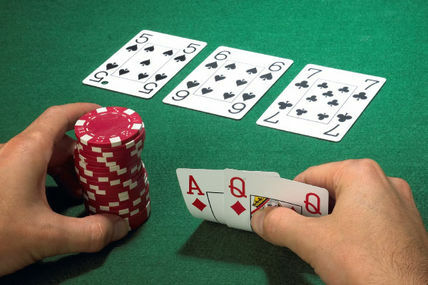 For super new people coming into poker, the flop is the first three cards that are laid down by the dealer. The flop is where the power sits. If nobody has raised pre-flop, you need to consider that they might be either slowplaying a monster, or trying to see if a marginal hand will be kissed with some good luck. When a good flop comes down, newbies can get excited. K-K-Q? That’s a really cool flop. But if you don’t have an A for a kicker, you might find yourself beaten up by somebody that has KQ, KK, QQ or AK. All of those hands would probably reflect heavy betting. If you know that you only have say, J-9, you might need to fold. Some people would still play, but the thing is — even if you get the straight you’re looking for, someone has the setup they need for a full house or even a four of a kind. It just depends on what the random hole cards they got dealt really were. Paying attention to betting in connection to flops is a good thing. The flop gives give you some good cared to go on. A natural flush draw with high enough cards to make it worth going all in? Awesome. Getting AA when the flop comes down 8-9-10? Not so great. Playing good poker means showing restraint when you want to go all out. It means that you can’t give in to playing with your gut all of the time. Sure, as you get better in poker, you’ll see certain situations pop up more often. Because you’ve gotten more experience under your belt, you’ve learned to handle this accordingly. Some people, however, will always sit and wonder whether or not they’re going to really get things off the ground. There’s no substitute for hard work in poker, so make sure that you just keep playing those hands and studying your statistics. That’s really all there is to it. Good luck!